Advances in Marine Biology has been providing in-depth and up-to-date reviews on all aspects of marine biology since 1963 -- over 40 years of outstanding coverage! The series is well-known for both its excellence of reviews and editing. Now edited by Michael Lesser (University of New Hampshire, USA), with an internationally renowned Editorial Board, the serial publishes in-depth and up-to-date content on a wide range of topics that will appeal to postgraduates and researchers in marine biology, fisheries science, ecology, zoology, and biological oceanography. 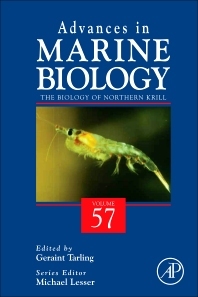 This thematic volume, edited by Geraint Tarling, provides a comprehensive review of the biology of Northern Krill.